How does it feel to watch your work being presented on a large screen? Unfortunately, I’ve not had a chance to see the finished result at the movies. But my experience over the years has been such, that it feels great to work on something for movies. On top of my own contribution, there are many more factors that enhance my work in the finished film. 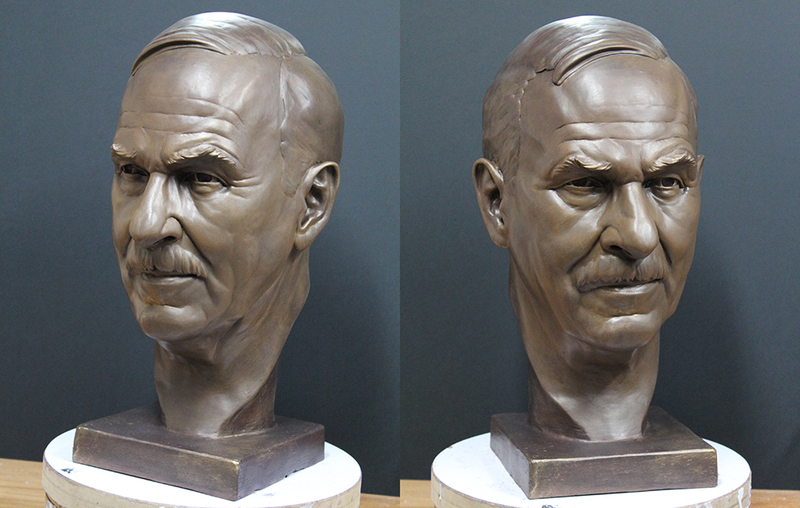 How did you get to work on the Tom-Wilkinson-Bust? 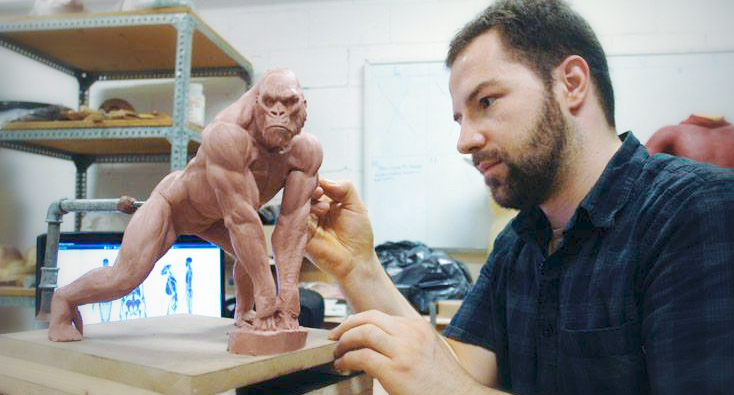 I had just finished sculpting for “The Beauty and the Beast” at Babelsberg, when I was approached by the studio’s manager to work on a portrait. After I committed to make the bust, he informed me about the project. On the same day I had a first meeting with production designer Adam Stockhausen and the art directors Stephan Gessler and Gerald Sullivan. Were you part of a team? Unfortunately, no. After the first meeting, I wanted to work on the bust in a shop in Kreuzberg, instead of Babelsberg (which is quite far away from my home). Each day, I sent pictures of the developing sculpture to the art directors. Did you get to meet Wilkinson? No. I didn’t even get any photos from the production office to make the portrait. I had to find pictures of Tom Wilkinson myself, using various search engines online. After modeling the bust, and after Wes Anderson’s approval, it was uncertain whether TW was actually available to play the part. After a two week waiting period it was confirmed and I set out to finish the bust. After intensive research regarding the actor, I’ll start planning the bust. The art department sent a reference regarding the style of the bust: it was a picture of a bronze portrait of Stefan Zweig, made in the 1930s in Paris. So I’ll start modeling and send pictures of that process to the art department on a daily basis. After final approval by Wes Anderson I’ll work on a mold, meaning I create a negative imprint of the sculpture (using silicone and epoxy resin). After making the mold, I’ll take a cast of it, again using epoxy. This will result in a positive copy of the sculpture. The final stage involves a paint job. I will apply many layers of paint to achieve a faux bronze look. How much time did you get for the job? After our first meeting, I proposed a ten-day-estimate for creating a finished bust. During the planning stage, I’ll estimate five days for sculpting the portrait and I’ll add another five days for what’s called „finishing“. Making the mold and putting on the final paint job will result in another week of work. At least in theory. However, as communication with the production office went back and forth, the making of the bust took up an entire month. I sculpted the bust using Tech Clay. The finished portrait is made of epoxy resin and painted with various acrylic paints. Would you have liked to make some changes during the process? I would’ve liked to take pictures and measurements of Wilkinson, myself. I think I would’ve been happier with the finished result. Who built the finished bust? To make the mold, Martin Schaeper (Design of Illusion) helped in the shop. The epoxy-cast and finished painting was done by myself. Did you get to meet Wes Anderson? What was his reaction to the finished bust? Apart from the non-direct approval there was no contact. Due to new projects I wasn’t able to attend any screenings or the premiere. What was the reaction to your work? Who commented? I post my work on social networks. I got positive feedback from my colleagues. Do you find it a special occasion to work on a Hollywood film? Are there differences between this and German productions? It’s always a special moment to see your work on a big screen. The main difference between German and Hollywood productions is that I get more trust and more flexibility on the latter. I think it might be, because Hollywood is more concerned about experience/ skills and less about saving money. Any future projects you can talk about? Anything besides movies? Some new pieces of mine can be seen in Guardians of the Galaxy, Dracula Untold , and in Ridley Scott’s Exodus. At the moment I’m working in England on a project concerning a pet subject of mine: great apes. In between projects I’m working on sculptures for my first fine arts exhibition. It’ll be about „The Seven Deadly Sins“. In addition, we are working on a retrospective art book covering the past ten years of my work in the movie business called „The Sculptural Art of Sebastian Lochmann“. And i am glad reading your article. But wanna remark on few general things, The site style is perfect, the articles is really nice : D.
Directors are hardly ever involved in the little details of movie making. This is more to blame on the producer/ art department than the director. But it’s still a shame, that the artists almost never get to see the director. Sebastian also worked on ‘Dark Shadows’ and never got pictures of Eva Green (for whom he developed some make up) or a meeting with Tim Burton.